Although America is one of the wealthiest countries in the world, the endless cycle of poverty is raising concern among other nations. Many scholars, politicians, social workers, and teachers work to reduce poverty and provide greater opportunities for people less fortunate. 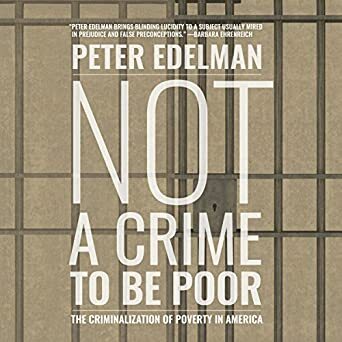 Peter Edelman’s recent book, Not a Crime to Be Poor: The Criminalization of Poverty in America, calls for reform within our social programs and judicial system. Edelman discusses the flaws in the American court system to which low income families fall victim. Edelman is a law professor at Georgetown University who specializes in constitutional law and social welfare. He presents his work in two parts. The first part discusses specific social and judicial issues and how the poor are taken advantage of by excessive bail, mass incarceration, and nuisance ordinances. Part two explains the reforms that have taken place or are currently underway across the nation. Ultimately, his work captures the imperfections America faces regarding the destitute. The author formats his book by addressing specific judicial and social justice issues, explaining exceptions to those issues, and discussing possible solutions. He admittedly refrains from adding any personal comments, which allows the reader to make his/her own inferences. The statistics and examples, however, lead the reader to sympathize with the impoverished. The resulting effect encourages the author’s agenda, which calls for social reform. Edelman continually cites evidence in favor of the poor and picks apart flaws in the government’s social programs, which counters the claim they are beneficial. A major shortcoming to his points is that the research he cites does not directly compare those who benefit from social programs to those who don’t; the data are qualitative, and he is rather too confident in this conclusion that the programs are ineffective as a result of this limitation. Edelman claims the programs would be effective with more funding and that the poverty-stricken have no defense within a heartless government, yet he often mentions programs that aid these people. Ultimately, he argues that the greatest impediments are too few advocates and ineffective programs. In the latter part of his book, Edelman discusses possible solutions and presents examples of what counties and states have put into place to correct the issues. This section weakens his arguments because the examples are excessive, which takes away from his main ideas. Not a Crime to Be Poor: The Criminalization of Poverty in America calls for amelioration of poverty through reform of social programs and the judicial system in the US. The intended purpose is to inform the reader and inspire social reform. Thus, the author appears to have a more liberal outlook in his work. The work is thorough and well communicated to the reader, but the evidence is overstated; the survey research largely at the base of his arguments makes it impossible to draw causal conclusions. This book is highly recommended for those interested in the fields of sociology, social work, psychology, and law, or anyone interested in how social programs work in American government.